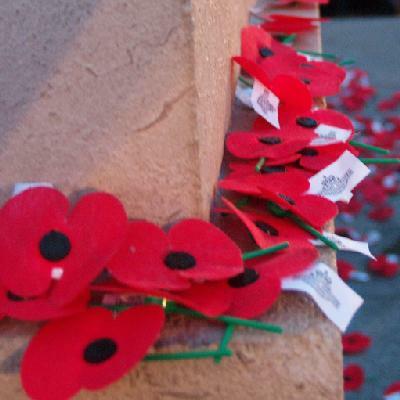 The Roll of Honour contains the names of all the men known to have served at one time with the 1st New Zealand Machine Gun Squadron and gave their lives in service of New Zealand during the Battle of Rafa, Sinai, 9 January 1917. Robert Aitken REID, Died of Wounds, 11 January 1917. 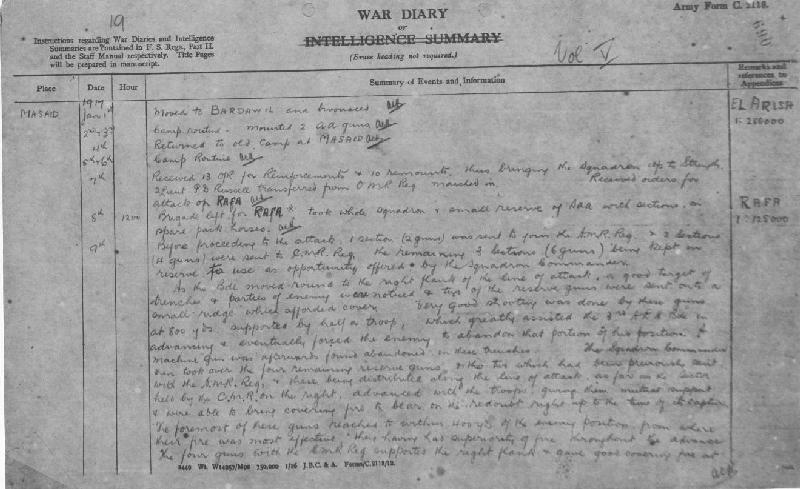 The following is a transcription of the 1st New Zealand Machine Gun Squadron, War Diary Account detailing their role at the Battle of Rafa, Sinai, 9 January 1917. 1200 Brigade left for Rafa took whole squadron and small reserve of Small Arms Ammunition with section on spare pack horses. Before proceeding to the attack, 1 Section (2 guns) were sent to join the Auckland Mounted Rifles Regiment and 2 Sections (4 guns) were sent to Canterbury Mounted Rifles Regiment. The remaining 3 Sections (6 guns) being kept on reserve to use as opportunity offered by the Squadron Commander. As the brigade moved round to the right flank of the line of attack, a good target of trenches and parties of enemy were noticed and two of the reserve guns were sent onto a small ridge which afforded cover. Very good shooting was done by these guns at 800 yards supported by half a troop, which greatly assisted the 3rd Australian Light Horse Brigade in advancing and eventually forced the enemy to abandon that portion of his position. A machine gun was afterwards found abandoned in these trenches. The Squadron Commander then took over the four remaining reserve guns and the two which had been previously sent with the Auckland Mounted Rifles Regiment and these being distributed along the line of attack as far as the sector held by the Canterbury Mounted Rifles Regiment on the right, advanced with the troops giving them mutual support and were able to bring covering fire to bear on the redoubt right up to the time of its capture. The foremost of these guns reached to within 400 yards of the enemy position from where their fire was most effective, they having had superiority of fire throughout the advance. The four guns with the Canterbury Mounted Rifles Regiment supported the right flank and gave good covering fire at effective ranges. These guns were placed on a trench and afterwards moved forward into a sunken road from which places they were able to sustain overhead covering fire until the assaulting troops were within a few yards of the trenches. Their position was of such nature that had our troops been compelled to retreat these guns would have been most useful in covering their retirement. During the day many good targets were found at all ranges from 400 to 1800 yards and of the chief functions of machine guns, that of covering our troops advance by keeping the enemy down in their trenches was carried out most effectually. The cooperation between our guns and our troops enabled the latter to advance across very exposed ground up to an extremely strong position with comparatively few casualties. In this way 40,000 rounds Small Arms Ammunition were used, this being more than the amount laid down to be carried by a Machine Gun Squadron but made up by extra bulk Small Arms Ammunition on spare pack horses. More could have been used to advantage had it been available but owing to Regimental reserves not coming up, the amount of fire had to be restricted when the troops were not actually moving across the open. Owing to the absence of cover for led horses within 3000 yards of the enemy position, all ammunition had to be carried great distances but the supply was maintained owing to the energy of the ammunition carriers. The system of keeping a larger number of guns as a reserve under the Squadron Commander was found very satisfactory and it would even be of greater advantage to have the whole Squadron so employed except where Regiments are sent off on a separate mission. The Regimental Lewis Guns enabled the machine guns to be used more to give covering fire from good points and to be sent when and where most needed instead of being attached to Regiments where they may not be required as much as at some other point. In the long advance across open ground exposed to heavy fire, the Maxim Guns were again found to be very awkward owing to their great weight and consequently the Vickers had to be used often and had to lead the way. Carrying the Maxim Guns told heavily on the men and exposed them to a great deal of fire. Casualties - 1 Other Rank Killed 7 Other Ranks wounded. 1800 Marched to Sheikh Zowaiid and bivouacked for the night. 0700 Returned to El Arish and to old camp. In 1923, J. H. Luxford published a history of the New Zealand Machine Gunners during the Great War called: With the Machine Gunners in France and Palestine. The book included a chapter on the work performed by the 1st New Zealand Machine Gun Squadron during the Battle of Rafa, Sinai, 9 January 1917 which are extracted below. Sinai was not yet clear of the Turk; he still retained a foot-hold at Rafa with a strongly entrenched position at Magruntein, held by a force estimated at 2000. The General Staff decided to strike at this point to endeavour to surround and capture the garrison in the way that had been so successful at Magdhaba. General Sir Philip Chetwode was sent on the evening of 8th January with a force comprising Yeomanry, Anzac Division and the Imperial Camel Corps, supported by artillery, with the object of surrounding and capturing the garrison. A few light armoured cars accompanied the force. The Brigade's portion of the operation was the capture of Rafa. The Squadron participated in the thirty mile night ride, and in the early morning sent two guns to the Auckland Regiment, four guns to the Canterbury Regiment, keeping six guns as a mobile reserve under Capt. Harper, O.C. Squadron. The attack was one of the most successfully executed operations in the campaign, the whole objective being attained in the very nick of time—just before the large enemy rein-forcements were able to throw their weight into the scales; but the reinforcements were not only too late, but the main body advancing from Shellal was driven off by the 5th Australian Light Horse, after suffering heavy casualties from the bombs and machine guns of our airmen. The machine gunners were fully engaged throughout the day, and the splendid handling of the mobile reserve guns under Capt. Harper won high praise. As the Brigade moved round to the right flank of the line of attack, a good target of trendies and enemy parties was noticed by Capt. Harper. One section was sent forward to deal with the target. The officer in command of the section, Lieut. P. D. Russell, by carefully reconnoitring the position, brought his guns into action from a small ridge that provided good cover. These two guns had a wonderful field of fire, and successfully engaged many targets. It was seen that not only could these guns harass the enemy, but they could give valuable assistance to the 1st and 2nd Light Horse Brigades on the left. Half a troop of Mounted Rifles was requisitioned to protect the guns, and throughout the day they continued their work. The Light Horse Brigades quite frankly admitted that without the support of these guns they could not have reached their objective. Capt. Harper took the four remaining reserve guns and the two guns that had been allotted to the Auckland Regiment for distribution along the line of attack as far as the sector held by the Canterbury Regiment. The six guns were then moved up to the front line of the attack. As these guns were being moved across an exposed stretch at the gallop, the gunners came under machine gun fire. Trooper R. A. Reid was leading a gun pack when he was shot through the spine. In spite of this he continued in the saddle and led his pack horse another 250 yards, to where the gun teams halted under cover; he then fell from his horse, and was at once examined by the doctor. His officer, thinking he would comfort him, said: "You'll be alright, Reid. You're hit in the muscles of the back." Reid replied: "Ye'r lying, sir, I'm shot through the back, but I hung on to my horse tho'." He died two days later. For a pack horse leader to let his charge get loose was an unpardonable sin in a Mounted Machine Gun Section; this stolid Scotchman, in spite of his terrible wound, determined that his record should not be broken at the last, and succeeded. It was seen that a strongly-held enemy redoubt was interfering with the advance. The six guns were then ordered to engage the redoubt, and after about ten minutes gained complete superiority of fire. Four of the guns then maintained a rapid fire upon the redoubt until it fell to the attacking troopers. As the troopers began their assault on the redoubt one subsection had to cease fire because it did not have sufficient clearance to cover the advance. The officer in charge of these guns left two men "to look after" them, and with the rest of the subsection joined in the charge that carried the redoubt. Although this officer's action cannot be commended from a strict military point of view, and in fact was deserving of censure, it was typical of the irresistible zeal that permeated our mounted troops. After the fall of the redoubt four guns pushed ahead to the forward line, from which they raked the enemy positions, which were holding up the Australians and the Camel Corps. The positions were by this time almost surrounded, and shortly afterwards were captured: this brought about the fall of the Magruntein fortifications. The four guns with the Canterbury Regiment supported the right flank with covering fire. As the attack progressed, the guns were moved up, first to an old trench, and then to a sunken road, from which positions they were able to sustain overhead covering fire until the troopers were ready to make their final assault. The fire lifted as the troopers dashed forward—reaching their objective with few casualties. The excellent gun positions along the sunken road were maintained, because they were such that if our men had been compelled to withdraw they could have been properly covered. The covering fire of the Squadron was of a very high order, and in a decisive manner beat down the enemy rifle and machine gun fire, and as the battery supporting the attack of the Brigade had run out of ammunition the final attack of the Brigade depended entirely on the covering fire of the Squadron's guns. The lack of co-operation between the regiments and the guns, that was so noticeable in the August operations, had completely disappeared, to the mutual advantage of both. The very light casualties sustained by the regiments were largely due to the co-operation that was maintained with the gunners. The Squadron expended 40,000 rounds of ammunition—which exceeded the amount laid down to be carried by a Squadron. The ammunition pack animals could not be brought up to the gun positions to replenish supplies, which necessitated extra work for the ammunition carriers; had the ordinary regimental supplies also been brought up, the guns could have been used to greater advantage, as the fear of a shortage curtailed the volume of fire. The idea of keeping a larger number of guns as a reserve under the Squadron Commander was found very satisfactory, and, except when the regiments were sent off on independent missions, it was considered that the whole Squadron should remain under its own Commander. The Lewis guns, which now had been added to the regimental establishment, released the machine guns for covering fire. Keeping the Squadron under its own Commander during an operation enabled guns to be sent when and where they were most needed, instead of being attached to the regiments where they might not be required as much as at some other part. In the long advance over open ground exposed to heavy fire, the Maxim guns were again found to be very awkward, owing to their great weight, and consequently the Light Vickers Guns were used to a greater extent. The Squadron was withdrawn for the night to Sheikh Zawaiid, and next day returned to the old camp near El Arish, where it remained until 22nd February. During the period in camp, Lieut. Yerex rejoined the Auckland Regiment, and Lieut. A. C. Hinman was appointed Second in Command of the Squadron.